Joe Biden once called state-mandated school integration “the most racist concept you can come up with,” and Barack Obama “the first sort of mainstream African American who is articulate and bright and clean.” He was a staunch opponent of “forced busing” in the 1970s, and leading crusader for mass incarceration throughout the ‘80s and ‘90s. Uncle Joe has described African-American felons as “predators” too sociopathic to rehabilitate — and white supremacist senators as his friends. And, as of this writing, a plurality of black Democrats want him to be their party’s 2020 nominee. Whether Biden can retain that support, after voters learn more about his problematic past, could very well determine the outcome of the party’s primary race. To explore that question, let’s pick through the former vice-president’s hefty baggage on racial justice — and then, the case for thinking that Obama’s halo will prove to be brighter than the shadow of Biden’s record is dark. Biden helped kill the most effective policy for improving black educational attainment that America has ever known. Joe Biden was for desegregating America’s schools, until his constituents were against it. When the Delaware Democrat launched his first campaign for the Senate in 1972, the Supreme Court had just ruled that the Constitution required policymakers to pursue “the greatest possible degree of actual desegregation” — and that forcing white students to attend schools in black neighborhoods, and vice versa, was a legitimate means of doing so. Being an enlightened liberal, Biden began his candidacy as an advocate for such policies. He accused Republicans of demagoguing the busing issue, and appealing to white voters’ ugliest instincts. But as his campaign progressed, and Biden discerned that the arc of history was bending toward white backlash, the young candidate bent with it. He became a caricature of a white northern liberal — arguing that forced busing was appropriate for the South (where segregation was the product of racist laws), but unnecessary for the North (where, Biden pretended, it merely reflected the preferences of the white and black communities). Once in the Senate, Biden continued to triangulate, voting for most, though not all, f the anti-busing amendments that came before him. But for his overwhelmingly white constituents, nothing less than massive resistance to busing would suffice. The New Castle County Neighborhood Schools Association booed Biden off the stage at one event in 1974. One year later, the Delaware senator broke ranks with northern liberals— and joined his virulently racist North Carolina colleague Jesse Helms in voting to kneecap all federal efforts to integrate schools, anywhere in the country. Specifically, Biden voted to bar the Department of Health, Education, and Welfare from requiring schools to provide information on the racial makeup of their student bodies — thereby making it nigh-impossible for Uncle Sam to withhold federal funds from school districts that refused to integrate. … Like the Helms gambit, [Biden’s provision] would still gut Title VI of the Civil Rights Act. But this time, a number of liberal senators that had opposed Helms’s amendment now supported Biden: Warren Magnuson and Scoop Jackson of Washington, where Seattle faced impending integration orders; and Thomas Eagleton and Stuart Symington of Missouri, where Kansas City confronted a similar fate. Mike Mansfield, the majority leader from Montana, also jumped on board. Watching his liberal colleagues defect, Republican Jacob Javits of New York mused, “They’re scared to death on busing.” The Senate approved Biden’s amendment. Biden had managed to turn a 48-43 loss for the anti-busing forces into a 50-43 victory. The NAACP called Biden’s proposal “an anti-black amendment.” The Senate’s sole African-American member, Ed Brooke, called it “the greatest symbolic defeat for civil rights since 1964.” But Biden helped his fellow liberals reconcile themselves to the wrong side of history by recasting integrationists as the real racists. As of 2007, Biden believed that this stance had aged well. In a memoir released that year, the soon-to-be presidential candidate derided busing as “a liberal trainwreck.” Education experts disagree. Since some municipalities did integrate their schools through busing (however temporarily), while others did not, scholars have been able to evaluate the policy’s efficacy. In 2011, researchers at Berkeley found that black students who had spent five years in desegregated schools went on to earn (on average) 25 percent more than those who remained in segregated schools (or, in Biden’s phrasing, schools that honored the “black awareness concept”). Other studies have found that racial segregation impairs learning for black students so severely, it outweighs the positive effects associated with higher household income — while integration enhances educational outcomes more profoundly than increasing a school’s safety. Meanwhile, contrary to so many white parents’ fears, integration was not associated with any negative effect on white students’ educational performance. The rationale for integration is not, as Biden suggested, that black kids need to sit next to blue-eyed ones in order to retain information. Rather, it is that, in a racially stratified society, overwhelmingly African-American schools will (almost inevitably) be sites of concentrated poverty, underinvestment, and relatively low social capital (i.e., places where children from low-income families will be unlikely to form connections with children from higher-income ones). Biden never ceased expressing his concern for black children’s inadequate educational opportunities. But he has done more to perpetuate those inadequacies than to remedy them. Biden worked tirelessly, over several decades, to make America’s (profoundly racist) criminal-justice system more punitive than any other advanced democracy’s. It is hard to name an infamously unjust feature of America’s criminal-justice system that Joe Biden didn’t help to bring about. Mandatory minimum sentences for nonviolent drug offenders, the sentencing disparity between crack and powder cocaine, civil asset forfeiture, and extensive use of the death penalty — the Delaware senator was involved in establishing them all. As a result of these policies — and many others — the United States imprisons a higher proportion of its population today than any other developed country. This is not because Americans commit more crimes — victimization rates in the United States are comparable to those in Western Europe. Rather, it is because we impose harsher sentences on convicts than any other nation deems conscionable. And for the bulk of his political career, Joe Biden made mandating such sentences one of his defining causes. 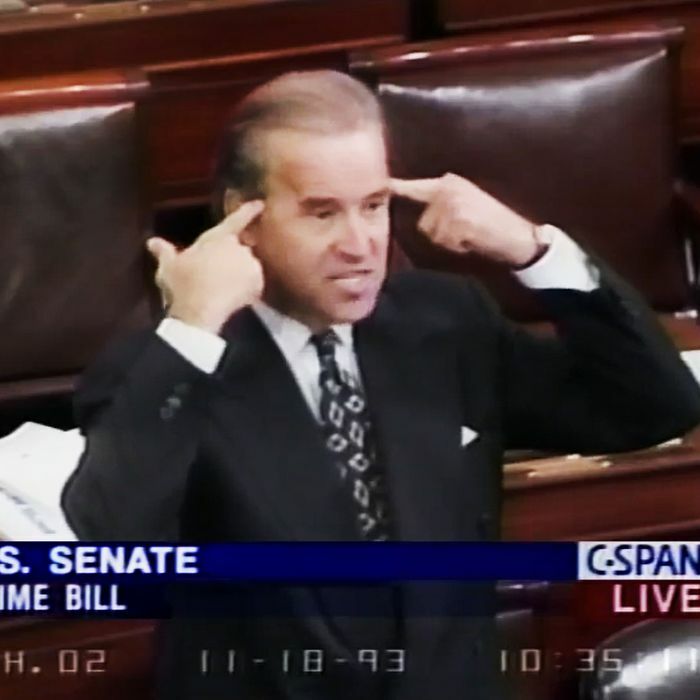 As a high-ranking member of the Senate Judiciary Committee, Biden didn’t just craft the 1994 crime bill — he also ushered a variety of other draconian measures into law. As with busing, Biden leaned left on criminal justice early in his career. In 1981, he criticized Republicans for pushing longer sentences for nonviolent offenders when prisons were already overcrowded. But, as with busing, Biden was one of the first liberals to discern the rightward shift in public opinion on criminal justice — and quite possibly, the most enthusiastic convert to the gospel of law-and-order liberalism. During the 1980s, Biden helped pass laws reinstating the federal death penalty, abolishing federal parole, increasing penalties for marijuana possession, expanding the use of civil asset forfeiture, and establishing a 100-to-1 sentencing disparity for possession of crack cocaine (used disproportionately by poor nonwhite people) and powder cocaine (used disproportionately by rich white people). Biden’s support for these measures wasn’t a wholly defensive responsive to public outrage over violent crime. Rather, it was a proactive effort to capitalize on the electorate’s increasingly draconian mood. In 1989, George H. W. Bush gave a national address outlining his plans to ramp up the war on drugs. Biden delivered the Democratic response, and savaged the Republican’s plan to drastically increase incarceration for drug crimes — from the right. Four years later, Biden remained at the cutting edge of law-and-order liberalism. In a Senate floor speech recently spotlighted by CNN’s KFile, Biden raised awareness of the (mythical) threat posed by super-predators — a rising generation of inner city children so comprehensively failed by their parents and society, they had developed into incurable sociopaths whom the state could quarantine but never rehabilitate. The super-predator proved to be a myth. But the specter of inner cities teeming with irredeemable monsters and abandoned children helped rationalize both mass incarceration, and its racially inequitable character. Uncle Joe says the darndest (and/or most racially insensitive) things. Beyond his role in perpetuating systemic racism (through his opposition to school integration, and support for mass incarceration), Biden has long displayed a penchant for political incorrectness. His suggestion that Barack Obama was the first clean and articulate African-American to run for president is probably the most infamous of his gaffes. But the former vice-president also told a crowd of black voters in 2012 that Mitt Romney would “put you all back in chains,” and has a habit of badly impersonating Indian convenience-store clerks and call-center employees. But Biden’s most troubling “racially tinged” remarks might be those he does not regard as such. Specifically, the former vice-president has long boasted of his warm — and often legislatively productive — relationships with white supremacist southern senators. Biden’s sentiments read like a satire of nostalgia for bipartisan comity, laying bare the amorality and elitism inherent to celebrating collegiality for its own sake. Needless to say, a political system in which a man who believed that his dark-skinned constituents belonged to an “inferior race” — and must be quarantined to their own institutions to prevent the “mongrelization” of the white race — was not one that “worked” for said constituents. And Eastland isn’t the only white supremacist Biden can’t help expressing grudging admiration for. The Democratic front-runner also warmly eulogized Strom Thurmond at his funeral, and his insistence on fondly recalling his relationship with Jesse Helms “grates on even members of his own team, who have told him as much,” according to a recent report from the New York Times. Why Biden might well win the Democratic nomination with strong African-American support anyway. Late last month, Emerson College polled South Carolina Democrats on their preferences for the party’s 2020 nominee. Among African-American Democrats, there was little competition: Joe Biden boasted 43 percent of the demographic’s support — his closest competitor, Bernie Sanders, claimed a meager 15 percent. Kamala Harris’s support sat at 9. Emerson’s findings are consistent with broader national surveys of the 2020 primary, which consistently paint Biden as the front-runner — thanks, in no small part, to his popularity among black voters. How do we reconcile Biden’s considerable complicity in racial injustice with his enviable popularity among his party’s African-American base? One answer is the Biden’s apparent strength with such voters is illusory. The (likely) candidate is coasting off of his name recognition and association with Barack Obama. Once the primary campaign puts the history summarized above under the spotlight — along with Biden’s myriad other heresies against progressivism, including his support for bankruptcy reforms that hurt low-income consumers, his shoddy treatment of Anita Hill, and his advocacy for the Iraq War — black voters will see through his “malarkey.” This is quite plausible. But a recent focus group conducted by Democratic consultant Danny Barefoot of Anvil Strategies offers some limited evidence that it is nonetheless mistaken. Another explanation is that black voters find Biden’s heresies against racial liberalism forgivable. The man might have played a leading role in opposing busing, but he was ultimately responding to mobilized, majoritarian opposition that was all but certain to prevail no matter what position he chose to take. As for mass incarceration, the crack epidemic was truly a scourge, and even many African-American community leaders embraced the logic of “tough on crime” in its wake. It’s also conceivable that some portion of black Democratic primary voters agree, to this day, with Biden’s Clinton-era views on criminal justice. A significant minority of African-American Democrats identify as conservative, and indicate a broadly positive view of the police. As is the case in so many American communities, the most prominent black activist groups and public intellectuals tend to be both more ideological — and more ideologically left wing — than the median black voter. The average American votes less on the basis of ideology than identity. Black Democrats identify strongly with Barack Obama, and Obama spent eight years vouching for Biden’s fitness for high office. That might count for more than the misgivings of elite progressive commentators like myself. Regardless, in 2019, Biden evinces support for his party’s consensus on decarceration. Meanwhile, thanks to conservative courts, busing is a long-dead issue, of no contemporary political relevance. Within the Democratic coalition, the forces of racial liberalism are unmistakably ascendant. Whether that coalition has someone accountable to it in the next White House will almost certainly do more to determine federal policy on civil rights than the question of precisely whom that Democratic someone is. And with most polls suggesting that Biden is Team Blue’s most viable general-election candidate, one can construct a perfectly rational argument for why black voters and racial-justice advocates should rally behind Uncle Joe. That said, given the size and quality of the Democratic field — and the severity of Biden’s ideological offenses — I, for one, hope they conclude that he is unfit for rehabilitation. Will Black Voters Pardon Biden for His Racist Sins?